ABOVE: UK Pool Store’s Dane Wilson, pictured right, receives the Jim Johnson Filtration Shield from ISPE Vice-Present, Colin Day. 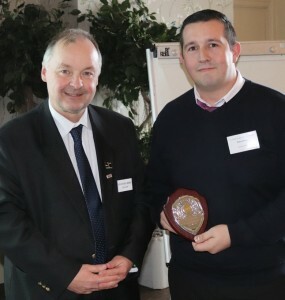 ISPE Vice-President Colin Day, who was chairing the meeting in the absence of ISPE President John Cheek, announced two special presentations at the 117th ISPE One-Day Seminar in Clevedon, North Somerset. The first was the presentation of the Jim Johnson Filtration Shield to Dane Wilson from the UK Pool Store in Kent. This trophy is awarded for an excellent technical paper, or presentation, on the subject of filtration, or, as in this year, for an outstanding ISPE Filtration exam paper. Dane had scored a very impressive 90% in his filtration exam. There was one more surprise award and this was for an ISPE Fellowship and he read a citation outlining the special contribution to the ISPE of Philip Barlow. A very surprised Philip was presented with his Fellow certificate and a silver ISPE lapel badge. A strong turnout of 45 delegates event held before Christmas, heard an informative presentation from Brian Tyler and Steven Gallagher from Lonza who talked about the impact of the ‘Biocidal Products Regulation’ upon European companies who manufacture, sell or distribute pool treatment products. To read more subscribe today ! !